Spelling is a key aspect of being able to write in French (as with any other language of course). Our Spelling Game is a simple activity to help beginners learning French to improve their spelling and word recognition skills with vital vocabulary they will need day to day in learning and using the language. 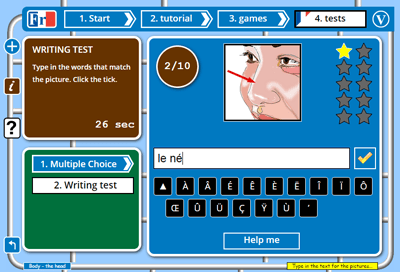 This Spelling Game does not rely on the learners typing in the vocabulary themselves. Rather, the learner must choose the vocabulary that is correctly spelt from a list of 5 very similar sentences or nouns (varying by only one letter). This is more difficult than it sounds and initially can take some time. Learners will gradually find the task easier as they continue practicing the activity. Spelling Game encourages faster word recognition for common and vital words and short sentences. 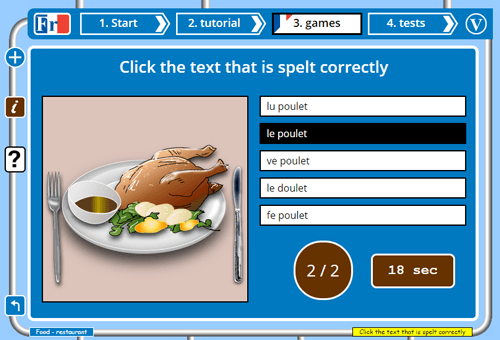 Spelling Game also improves the spelling skills of beginners learning French.